Mary Jean LeTendre, a heroine for homeless education, passed on April 6, 2019. 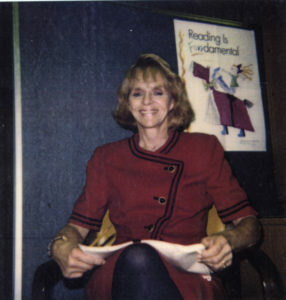 After a career as a teacher and a reading specialist, Mary Jean directed the federal Title I program from 1985 to 2001 as Director of Compensatory Education Programs at the U.S. Department of Education. I recall vividly the day that Mary Jean called me, over twenty years ago, to ask if the National Coalition for the Homeless would set up a scholarship fund in memory of her husband. At the time, I was very intimidated by Mary Jean – she was a giant in our world of homeless education. She made homeless children and youth a priority at the federal level, long before legislation mandated it. I was humbled and moved, and I gave a resounding “yes.” The following year, the first “LeTendre Education Fund for Homeless Children” scholarship awards were made to six students at the national homeless education conference in Orlando, Florida. In subsequent years, the program evolved with the support of the LeTendre family, the National Coalition for the Homeless, the National Association for the Education of Homeless Children and Youth, Dr. Patricia Popp, and Barb Dexter. I remember Mary Jean going to bat for applicants who had the traits and characteristics of her husband. In the midst of intense debates about the merits of candidates, Mary Jean would quietly say: “This student reminds me of Andre.” We honored both Mary Jean and Andre, and together, we changed the trajectories of many lives. When SchoolHouse Connection was founded in 2016, I knew that our first program would be a youth leadership and scholarship program. Drawing from the many years of experience at NCH and at NAEHCY, we created a comprehensive program to ensure college access and completion. Countless futures are brighter, and will continue to shine, because of Mary Jean”s dedication to education as a lasting escape from poverty, and her profound love for children. Mary Jean set an example for what it means to lead, and she had a tremendous influence on my life. I am deeply grateful.